Windsor Castle is situated in a commanding position on a cliff top, overlooking the town, the river and roads approaching Windsor. The medieval structure was meticulously maintained and no additions were made until after 1800, when James Wyatt was engaged to rebuild parts of the castle in the fashionable Gothic style. For all that, the castle was not a favoured home among the Hanoverian Monarchs. After visiting here in the early 18th century, Daniel Defoe commented that it was "the most beautiful, and most pleasantly situated castle, and royal palace, in the whole isle of Britain". The artist is the influential English watercolorist Paul Sandby. His brother Thomas Sandby was Deputy Ranger of the Royal Park at Windsor, and the two brothers lived there. During the 1770s, Paul Sandby produced many views of the Castle and its environs. In this print, Sandby has put a couple of caricatures pictures in the foreground on the right side. 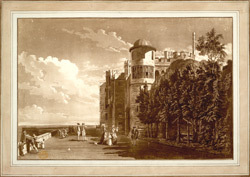 This is one of a group of four prints of Windsor Castle published in September 1776.